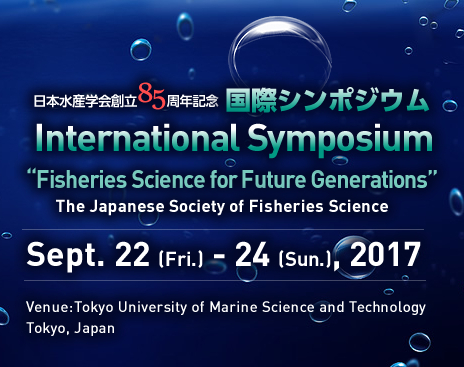 The Japanese Society of Fisheries Science Award: Awarded to members who have made outstanding achievements in academic studies and contributed to the development of fisheries science. The Japanese Society of Fisheries Science Award of Merit: Awarded to members who have made long-term contributions to the development and systematization of fisheries science. Scientific Achievement Award in Fisheries Science: Awarded to members aged 40 or older who have made outstanding scientific achievements and contributed to the development of fisheries science. Achievement Award for Young Scientists in Fisheries Science: Awarded to members aged 39 or younger who have excelled in research and who are expected to make further significant contributions in fisheries science. Technical Achievement Award in Fisheries Science: Awarded to persons who have made technically distinguished achievements and contributed to the development of fisheries science as well as the fishing industry. : Awarded for excellent research paper in Nippon Suisan Gakkaishi and Fisheries Science. We would appreciate it if you would kindly recommend candidates for the awards of the Japanese Society of Fisheries Science in accordance with the award rules (outlined in issue no. 3 of Nippon Suisan Gakkaishi). Briefly, the rules stipulate that members of the Society may recommend candidates for the awards from a broader perspective following prescribed formalities. Please download the award nomination form from the web page of the Society or request it from the Secretariat of the Society. Electronic files in MS Word format are also available and these can be requested by e-mail to fishsci@d1.dion.ne.jp (please specify the award category when requesting an electronic file). Nomination documents should be sent to the Secretariat of the Society by mail not later than the end of July. Please note the following regarding nominations. ◎ All awards are open to non-JSFS members. ◎ Achievements for which the Japanese Society of Fisheries Science Award, the Japanese Society of Fisheries Science Award of Merit, the Scientific Achievement Award in Fisheries Science and Achievement Award for Young Scientists in Fisheries Science are to be granted should be those that have already been printed or are in press, in whole or in part, in the journals of the Japanese Society of Fisheries Science, the Fisheries Science or Nippon Suisan Gakkaishi, or other academic publications. ◎ In principle, only one person can be nominated per one achievement for which an award is to be granted. ◎ In the case of cooperative achievements, for which at least one joint paper must have been published, joint nominations will be considered. In this case, however, please attach a statement of the reason why the award should be shared. ◎ Joint nominations should not include supervisors or persons who played merely an auxiliary role in the achievement(s) for which the award is to be granted.